Go anywhere on the internet and you’ll see that Irish brands are adopting the mind-frame of always-on publishers. They’re creating brilliant blogs, Spielberg-level emotive videos, and taking on the world with their banter on social media. Ireland has a long tradition of storytellers so it’s nice to see that we’re moving that tradition into the digital world. But how is content marketing really doing? Are we satisfied with the work we’re doing? Are our marketers willing to put real budget behind their content marketing? And do we compare to marketers in Australia, the UK, and the US? Karen Hesse, MD of 256 Media, and Tom Trainor, CEO of the Marketing Institute of Ireland, at the launch of the report. The most important part of any survey is the respondents. A survey without respondents is a lifeless list of questions. A further 25% worked as digital marketing or marketing executives. 35% of the respondents were B2C. 46% got the glory of marketing to consumers and other businesses. Regardless of who they are marketing to, Irish content is increasingly smart. Think of the clever campaigns of the last few years: Paddy Power’s ballsy social media, Temple Street’s website, Discover Ireland, Electric Ireland’s Powering Kindness, LovinDublin’s take on Irish life… The list is growing all the time. But what is it that’s making these campaigns work? Is success an illusion or do the stats back the magic up? Let’s find out! Are marketers actually embracing content and how is it going for them? Here are the highlights at a glance. 79% of Irish marketers rate their content marketing strategy as effective or extremely effective. 67% of respondents cite having a content marketing strategy in place. 26% have no strategy, and 6% aren’t sure. 48% have no documented strategy while 48% do. 75% of respondents are producing more content than in the same period of last year. More than a quarter of all respondents spend in excess of 25% of their marketing budget on content marketing. The hero of this piece: why are marketers turning to content? We wanted a definitive answer so we asked our respondents to tell us why they were using content marketing and what they hoped to achieve. Customer engagement is the lynchpin and what most marketers strived for. Lead gen is snapping right on its heels. Marketeers also really value brand awareness. Now you know who we were talking to and have an idea as to their budgeting, it’s time to get down to business and examine what they have to say. Let’s start off with the big one: do our respondents plan on backing their budget up with a content marketing strategy? A WHOPPING 67% of respondents have a content strategy. The last 6% can’t quite make their mind up. The uncertainties are a head-scratcher, but all will become clear soon! If you’re a bit of a Mystic Meg and you’ve taken a peek into your crystal ball, you’ll likely think that we’re in the midst of a very obvious content movement. If you’re a marketer, you may even have seen that 67% and started to worry about your content strategy. But that 67% isn’t quite what it seems. 46% of the respondents DON’T use buyer personas: they’re creating content but aren’t quite sure who that content is for. 48% of the overall respondents have NO documented strategy. None. Nada. Not so much as a post-it note with some scribbles on it. 45% don’t have someone in-house in charge of their content efforts. Content marketing is booming, but the strategy seems to have fallen through the cracks. Which leads us right onto what we’re calling the seven deadly sins of content marketing. As we sifted through the data, it became clear that Irish marketers are ploughing ahead with content but ignoring certain strategic moves that would result in a better ROI. But what are these seven sins? Creating content with no end-goal. Having no one in charge of content efforts. Having no content schedule in place. Taking an “it’ll do” approach. While companies and marketing teams are willing to cough up campaign ideas and a budget, there seems to be a lack of know-how when it comes to the strategy. But here’s the really interesting thing: the majority of our marketers are pretty happy with their content efforts and the results they are seeing. If they’re happy with no real strategy, imagine the results they’ll be seeing if they properly embrace smart strategic content. What metrics are Irish marketers measuring and how are they going about it? What kind of budgets are our marketers spending? How do Irish marketers compare to marketers in Australia, the US, and the UK? What tactics are working and what tactics aren’t? Where are Irish marketers succeeding and where they are they falling down? 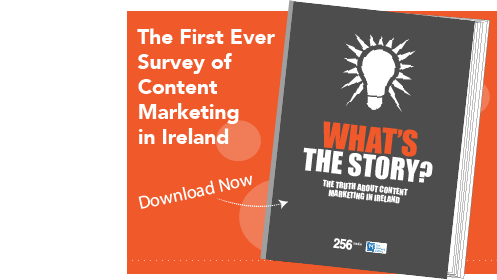 Find it all out in our State of Irish Content Marketing report! Click the image below to download the report!